Peter Paul Rubens (1577–1640), The Triumph of Truth (Marie de' Medici Cycle) (c 1622-25), oil on canvas, 394 x 160 cm, Musée du Louvre, Paris. Wikimedia Commons. 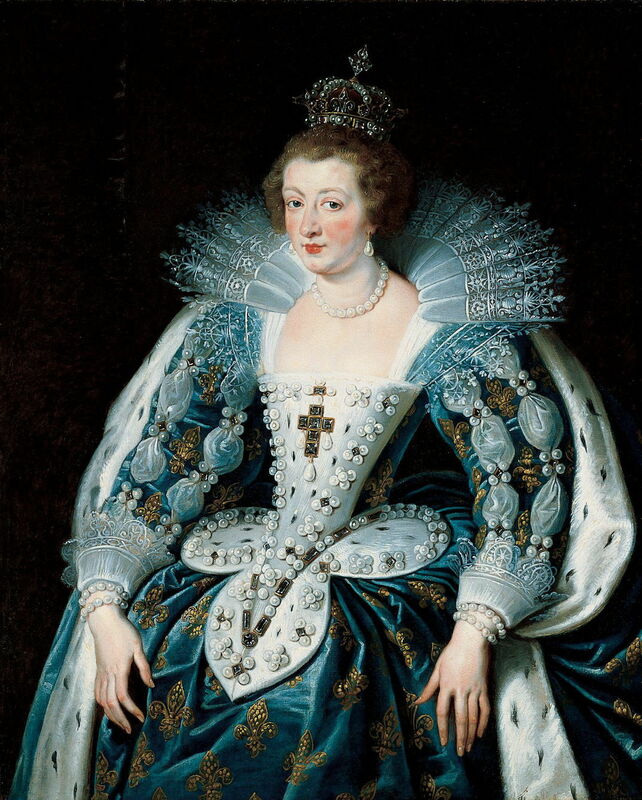 Marie de’ Medici, the Regent of France after her husband King Henry IV had been assassinated in 1610, planned to bring peace to Europe by marriage. In 1612, she had negotiated the betrothals of Anne of Austria (then aged 11) to her son Louis XIII of France, and his younger sister Princess Élisabeth (then only 10) to the future king of Spain, Philip IV. This article concludes my brief look at one of the stories in Rubens’ extraordinary series of paintings, the Marie de’ Medici Cycle, in the Louvre. The betrothal of Anne to Louis had not been easy. Her dowry amounted to half a million crowns, but was fully returnable in the event of Louis’ premature death – a very real possibility in view of the state of health and the risks of assassination at the time. There were also elaborate arrangements over her rights of succession. Peter Paul Rubens (1577–1640) The Exchange of Princesses of France and Spain, 9 November 1615 (Marie de’ Medici Cycle) (c 1622-25), oil on canvas, 394 x 295 cm, Musée du Louvre, Paris. Wikimedia Commons. 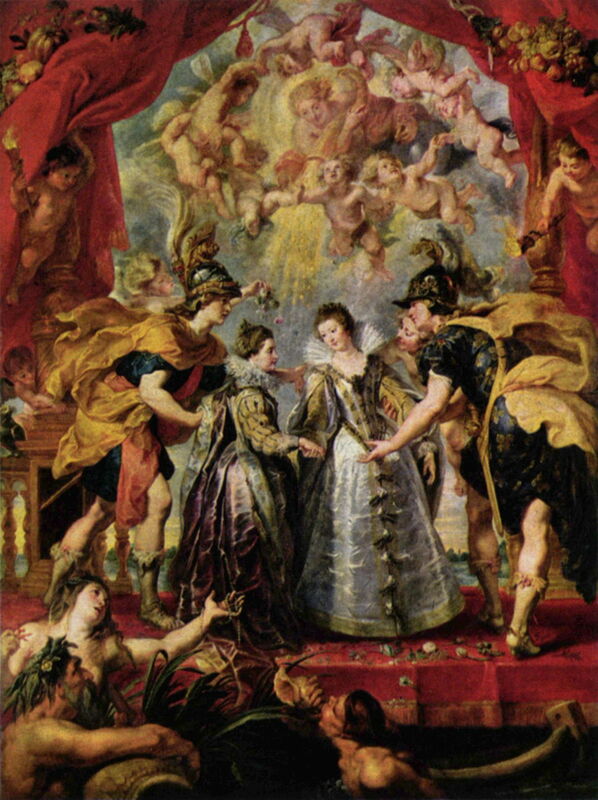 With the marriages taking place by proxy in Burgos and Bordeaux on 24 November 1615, Rubens continues his panegyric with The Exchange of Princesses of France and Spain, 9 November 1615. In the centre, shown in profile, is Élisabeth of France, who holds hands with Anne of Austria. They are presented by the personifications of France (right) and Spain (left), with the supervision of Hymen and putti bearing wedding torches. In the heaven above is ‘Felicity of a Golden Age’, who is showering the princesses with gold from a cornucopia, and is surrounded by more celebratory putti. In the foreground below is the god of the river Andaye, pouring water from his large pot, and attendant water deities. This exchange took place on a barge in the middle of the Bidassoa River, which formed the border between France and Spain. Rubens had intended that the next painting in the series was to show Marie’s expulsion from Paris by Louis XIII in 1617, but that was refused. Its replacement was apparently painted entirely by Rubens on the spot. Peter Paul Rubens (1577–1640), The Felicity of the Regency (Marie de’ Medici Cycle) (c 1623-25), oil on canvas, 394 x 295 cm, Musée du Louvre, Paris. Wikimedia Commons. The Felicity of the Regency shows Marie on her throne, in the role of the personification of Justice. At her left are Minerva (in her armour with her Aegis) and Prudence, around whose right arm a snake indicates serpentine wisdom. At the far right is Abundance carrying her cornucopia. At the left is Saturn, who holds his scythe signifying the march of time. Above them are two figures of Fama (Fame or Pheme) blowing fanfares on their trumpets. Below are Envy, Ignorance, and Vice, together with four attendant putti. 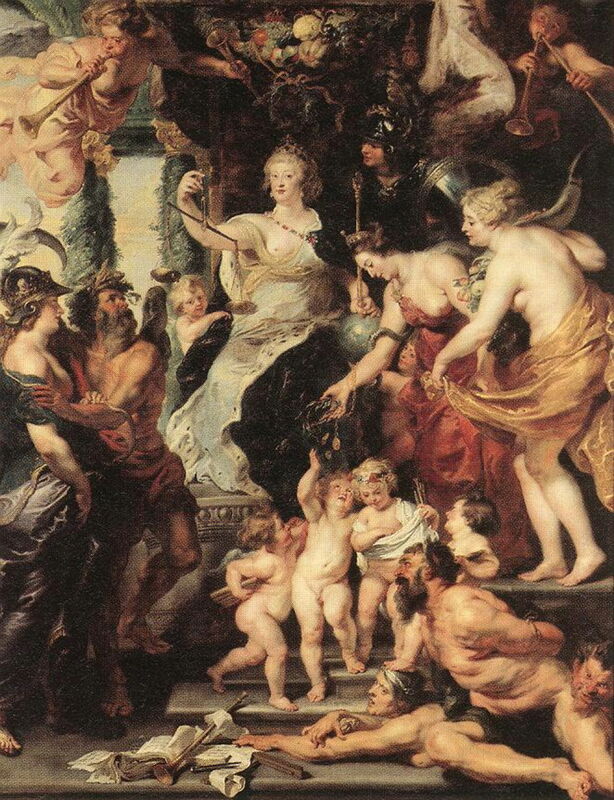 Rubens wrote optimistically that this shows the flowering of the Kingdom of France, under Marie’s rule of prudence and equity. In truth, the marriages did not proceed as planned. When they were only fourteen, Anne and Louis were put under pressure to consummate their marriage which might otherwise have led to annulment, but Louis did not co-operate. Marie prevented Anne from integrating into court by ruling France as its monarch. Louis claimed his throne in 1617, and around 1619 finally consummated their marriage, although her first live child was not born until 1638; he became King Louis XIV of France. 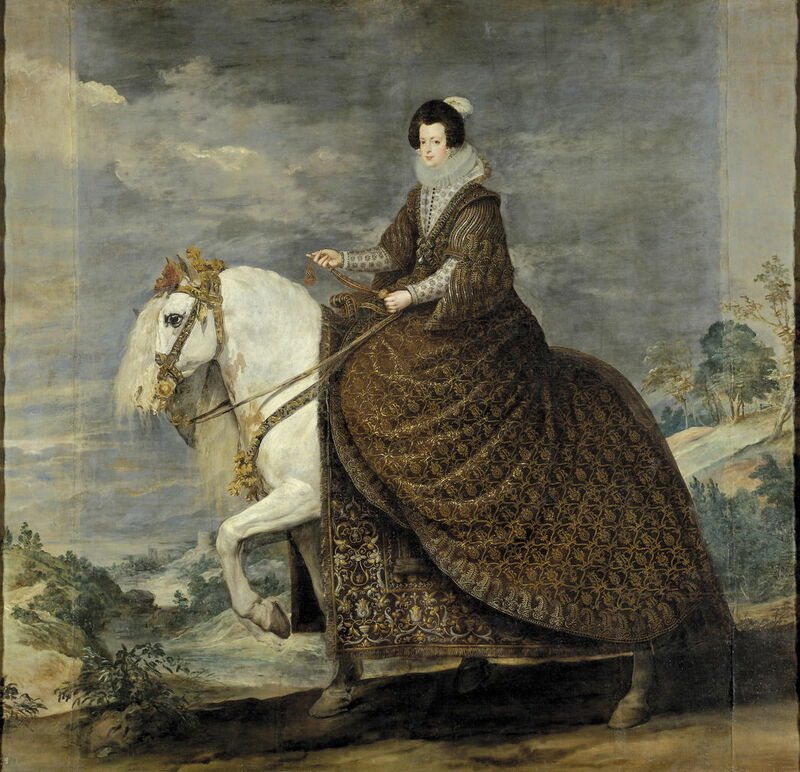 Élisabeth, known in Spain as Isabel, seems to have had a less troubled time despite her husband’s many mistresses. In 1621, the year that the couple claimed the throne following the death of King Philip III, she gave birth to her first child, but it was not until 1629 that she had a son, who died before he became seventeen. Peter Paul Rubens (1577–1640), The Triumph of Truth (Marie de’ Medici Cycle) (c 1622-25), oil on canvas, 394 x 160 cm, Musée du Louvre, Paris. Wikimedia Commons. Marie and her son, Louis XIII, were reconciled, at least for a time. Rubens depicts this in the last painting of the series, The Triumph of Truth. Mother and son are shown in heaven, at the top, joined by a symbol of concord. Below them, the winged Saturn is raising Veritas (truth), who is being ‘brought to light’. Marie’s plan to unite the crowns of France and Spain, and so bring peace to Europe, was a miserable failure. It did nothing to stabilise central Europe, where the Thirty Years’ War broke out in 1618. French involvement in that resulted in turn in the Franco-Spanish War, which started in 1635, before the birth of the future King Louis XIV of France. This did not deter Marie in her quest for diplomacy by matrimony: Rubens’ deadline for completion of the whole cycle was 13 June 1625, the date of the marriage of Marie’s daughter Henrietta Maria to King Charles I of England. Queen Henrietta Maria was forced to flee to The Hague in 1641, and Charles was executed in 1649. Ironically, Rubens was probably a much greater influence for peace in Europe than Marie. Thanks in part to his diplomatic efforts on behalf of the Spanish crown, Europe did not destroy itself by the time of Marie’s death in 1642. But she had long gone into exile away from France, and by a strange quirk of fate she died in the same house in Cologne which had been rented by Rubens’ parents when he was a young boy.